INDEVCO Paper & Containers Division centralizes technical expertise and services. Throughout its first year of operation, the Center of Technical Excellence (CTE) has developed a range of services to gather technical know-how in one central and easily accessible location. "We’re like a vault where you put your valuables," describes Dani Khoury, CTE Manager. "If you need to fetch them again, they’re easily available. This is really important for our plants, for upper management and owners." Khoury and the CTE team have concentrated first on providing technical training, conducting facility audits, and analyzing markets. Over the next year, they will also begin to standardize the variables that will allow them to create a homogeneous system for industrial performance across plants in different countries. Over 200 front-line operators and their assistants will receive technical training by the end of 2007. CTE trainers Fouad Issa and Toni El-Hachem spend around one month of every quarter on location at the manufacturing plants. They attend "train the trainer" programs and visit plants to assess specific training needs. Then they customize content and train front-line operators about corrugating processes and converting processes. "We don’t provide generic training," explains Khoury. "We customize it to the pain points or urgent issues at our affiliates." An important aspect is tailoring the language to plant operators. 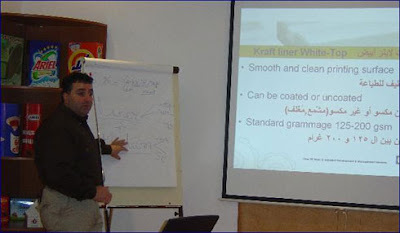 In Lebanon and Egypt, for example, facilitators communicate in Arabic. In Saudi Arabia, Asian operators receive training in English. In the post-training period, Issa and El-Hachem conduct gap analysis and report findings. They also return to the facilities to coach operators on the plant floor how to implement concepts discussed during training. In addition to technical training, CTE conduct 5S audits for housekeeping, workplace safety and machine cleaning and preservation at the plants. By following the 5 Ss - sort, set-in-order, shine, standardize, and sustain – it is possible to achieve a 5% improvement in efficiency. When needed, plant operators and their supervisors review the 5S pillars to reduce waste and maintain an orderly work environment. With training in progress and the marketing function organized, the CTE will devote the coming year to establishing industrial performance standards.Of particular importance are comparative assessment criteria to measure performance across INDEVCO’s corrugated plants. across our affiliates and with industry best practices," says Khoury. Within an industrial group like INDEVCO, opportunities exist to expand knowledge and processes to sister companies within the Paper & Containers Division, as well as to Flexible Packaging and Consumer Products business divisions. According to Khoury, an ideal glimpse of the future would include a center of technical excellence serving all INDEVCO manufacturing plants. The Center of Technical Excellence was founded in August 2006 to serve corrugated plants within INDEVCO Paper & Containers Division in the Middle East And North Africa (MENA) region. The CTE is responsible for technical training; marketing; performance assessment; quality, safety & hygiene management systems; and product development.